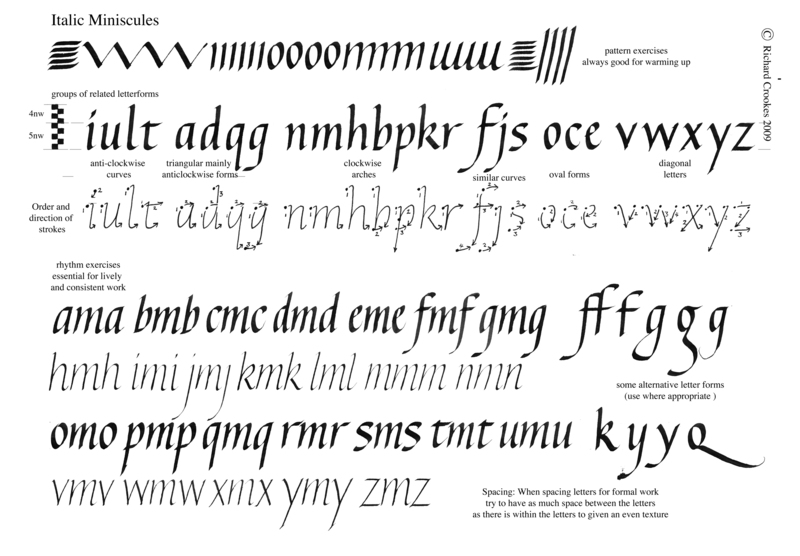 Some time ago, you might remember, I mentioned that one of my friends might just happen to come up with a lesson on Italics and save me the trouble. He heh. Today he has graciously given his consent for me to show these pages he put together for a recent workshop he conducted in Thailand. What a lovely job he has made of them. If you would like to see more of Richard’s work, and download these worksheets, have a look at his Website. Also he has Videos on YouTube. Here is one to compliment these pages. Many thanks Richard. More power to your elbow. 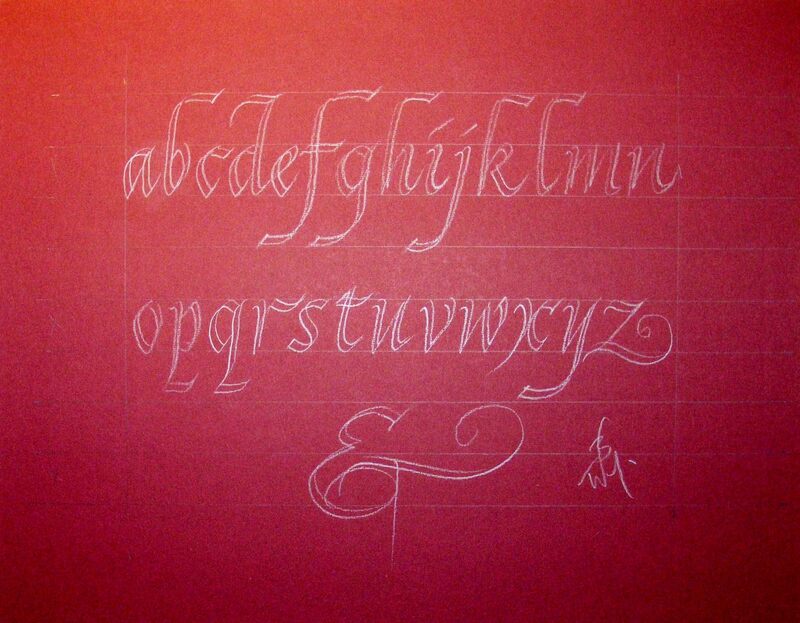 At last, Calligradoodles -0005 Italic minuscule. Over all, I am quite pleased, apart from one or two wayward ascenders. Bear in mind that the x height here is one and a half inches ie five nib widths. 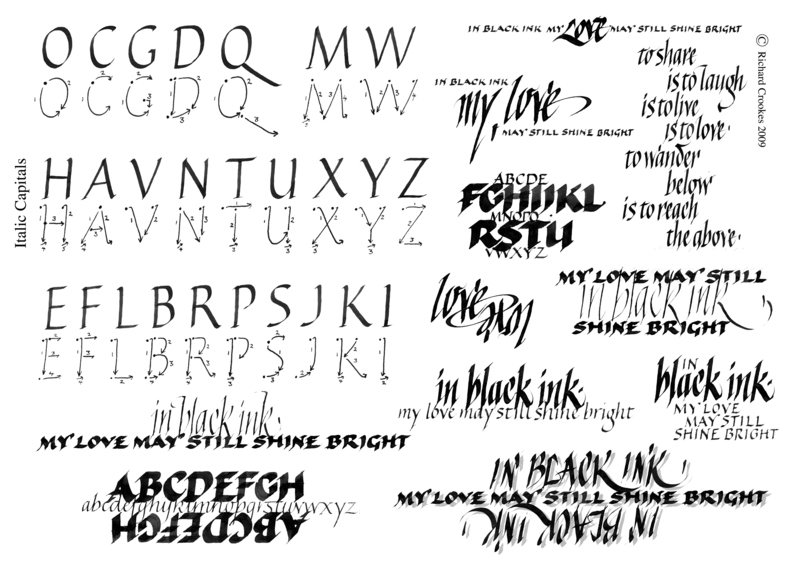 I have tried to give an indication of the rhythm generated by the italic script. Though the music is added after the video is published. it does seem to fit in quite nicely. I hope you enjoy it and that it is some help. Once you have got your teeth into italics you will need some capitals. These are my version. It has taken some years to reach this stage. 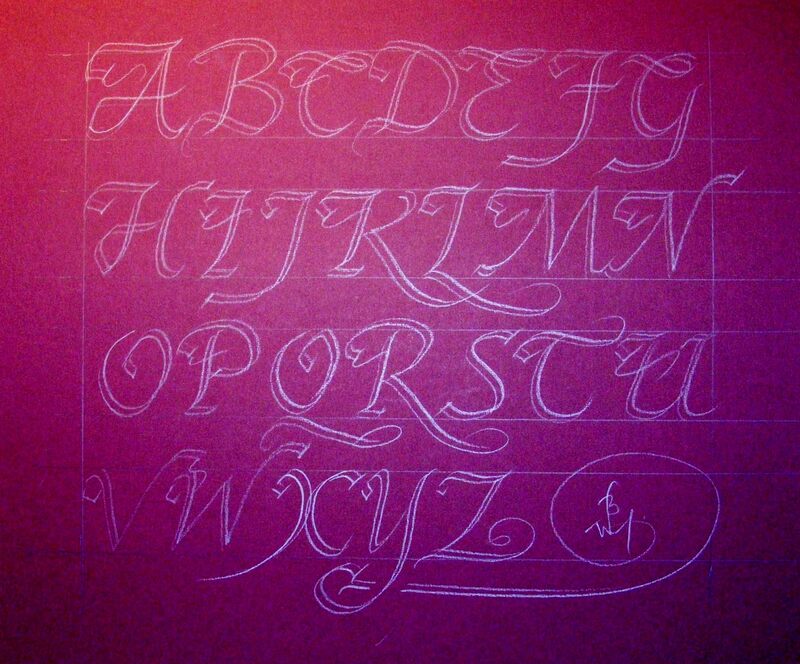 I strongly recommend that the beginner first studies Richard’s example before adding flourishes/swashes. These are eight nibwidths in height. That is two and a half inches. You will note that the minuscule x height was five nibwidths / one and a half inches. 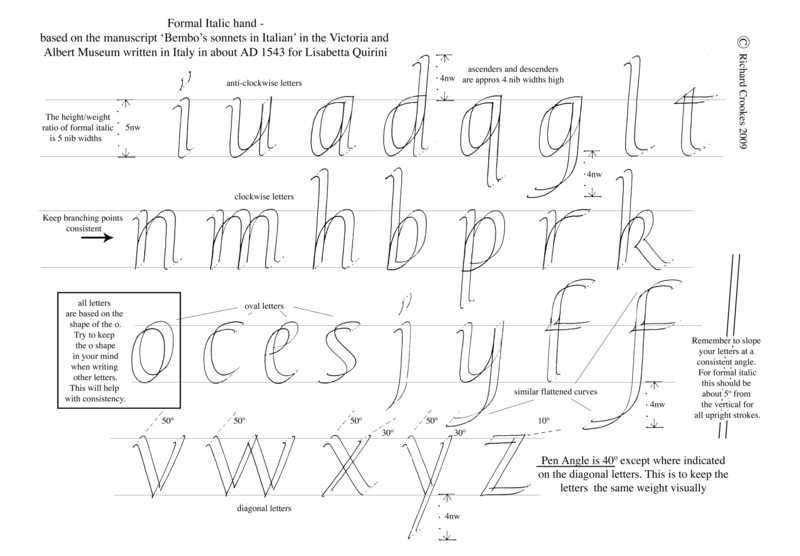 Whatever you do with Initial capitals, the capitals within a body of script look more balanced and seem slightly weightier if kept to approximately half the height again of the minuscule. Once again there are one or two letters here that have gone slightly awry. Rather than stopping to rub them out, thus spoiling the rhythm, I have again elected to carry on and show the whole sequence, warts and all. You might also like to have a look at Lloyd Reynolds’ epic series. If you have any questions regarding this lesson or any of the others, please ask them in the comment box. Others might like to see the answer too. 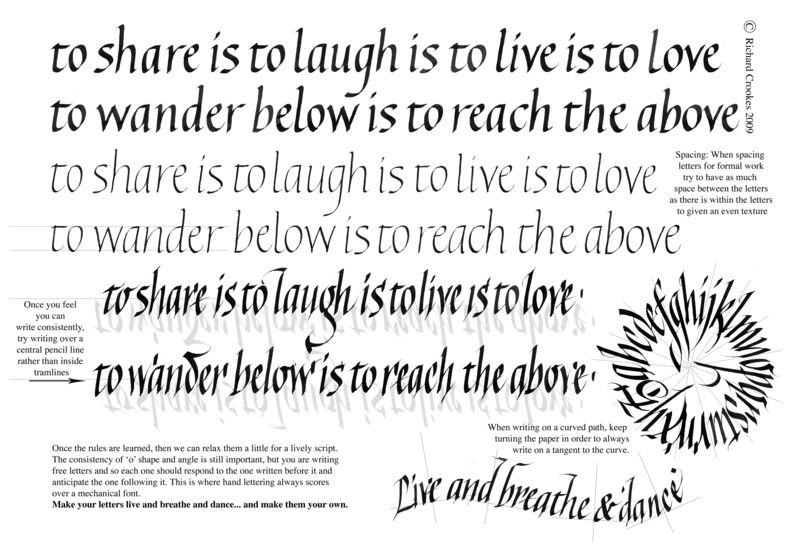 This entry was posted in ,calligraphy,calligraffiti,lettering, how to, calligraphy, Handlettering, Italic and tagged calligraphy, lettering, video, Worksheets. Bookmark the permalink. That is the great thing about scribes universaly. They all try to make things easier for those coming along behind them. It might be of some help.